Arkansas is located in the southeastern United States, in the West South Central Census Bureau division. 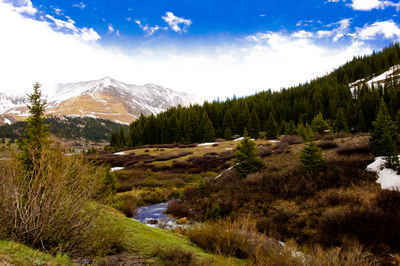 It's known for its abundant parkland and recreational areas, with terrain encompassing mountains, caves, rivers and hot springs. Arkansas covers an area of 53,179 square miles and ranks as the 29th largest state by size. The state borders six U.S. states: Missouri to the north, Tennessee and Mississippi across the Mississippi River to the east, Louisiana to the south, Oklahoma to the west, and Texas to the southwest. 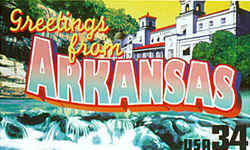 Arkansas is from the Quapaw (Sioux) word "acansa," which means "downstream place" or "south wind." Arkansas is the name of an Indian tribe. At the time of the early French exploration, a tribe of Indians, the Quapaws, lived West of the Mississippi and north of the Arkansas River. The Quapaws, or OO-GAQ-PA, were also known as the downstream people, or UGAKHOPAG. The Algonkian-speaking Indians of the Ohio Valley called them the Arkansas, or "south wind." The French Jesuits learned of a tribe probably called Quapaw, or Oo-gaq-pa, which the Algonquins pronounced Oo-ka-na-sa, and Marquette wrote Arkansoa; LaSalle wrote Arkensa; DeTonti, Arkancas; and LaHarpe, Arkansas. When the state was admitted to the Union in 1836, it was spelled Arkansas. During the early days of statehood, Arkansas' two US Senators were divided on the spelling and pronunciation. One was always introduced as the senator from "ARkanSAW" and the other as the senator from "Ar-KANSAS." In 1881, the state's General Assembly passed a resolution declaring that the state's name should be spelled "Arkansas" but pronounced "Arkansaw." Arkansas Code, Title 1, Chapter 4, Section 1-4-105. "The Natural State," was officially adopted as the Arkansas official nickname by the Eightieth General Assembly of 1995. Arkansas is known throughout the country for its natural beauty, clear lakes and streams and abundance of natural wildlife. This nickname replaced the official Land of Opportunity nickname following the slogan Arkansas Is a Natural that was used to promote tourism and outdoor recreation. Because of our unsurpassed scenery, clear lakes, free-flowing streams, magnificent rivers, meandering bayous, delta bottomlands, forested mountains, and abundant fish and wildlife, the official nickname for the State of Arkansas is proclaimed to be "The Natural State". History. House Concurrent Resolution, No. 26, Acts 1953, p. 1511; A.S.A. 1947, ? 5-110; Acts 1995, No. 1352, ? 1. However, the first official nickname for Arkansas came in 1923 when the legislature designated the state as The Wonder State. Was more officially known as The Land of Opportunity for many years. The earliest known nickname for Arkansas seems to be Bear State, recorded first in 1858, and this is a nickname to which several states have laid claim. Arkansas's earliest recorded nicknames, the "Bear State" and the "Toothpick State,"made reference to characteristic features of the region. In the first half of the nineteenth century, Arkansas was noted for its population of Louisiana black bears (Ursus americanus luteolus), one of sixteen black bear species found in the United States. Human activities reduced the population of native black bears to fewer than fifty by the middle of the twentieth century. Refer to Bowie knives handles. It was also sometimes known as The Toothpick State (alluding to the Bowie knife, the favorite weapon of the area, and which was sometimes called "a toothpick knife") The messy dispatching by knife of one Arkansas state representative by another in 1837 cemented the new state's renown as a violent place. Reference to hot springs. Hot-water State (because of the number of hot springs in the area). The derivation of the word "Rackensack" has been analyzed with no single sure source ever identified, but by the end of the 1840s, it was established as a burlesque synonym for rural Arkansas, particularly the hills of the western part of the state. John Wesley Huddleston, a farmer and sometime prospector, first found diamonds on the site in 1906. Huddleston's discovery sparked a diamond rush in Pike County. Diamond-bearing soil was also found on Millard M. Mauney's property that was adjacent to Huddleston's. Prospectors and fortune hunters rushed to the area, and soon the town of Kimberly developed to accommodate the influx of people.